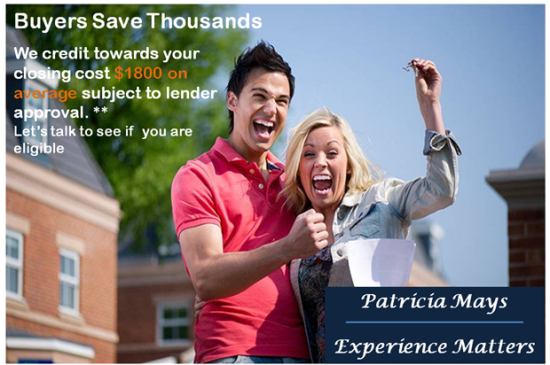 Patricia Mays real estate Credit amount may vary according to purchase price, prevailing market conditions, and other factors. Patricia Mays Credit towards to the closing cost of the buyer is not available in certain areas or where prohibited by law. The Patricia Mays credit is subject to adjustment or cancellation if the commission received by Patricia Mays from the cooperating broker is less than 1% of the property list price or $6,500 (whichever is greater), if the commission amount provided to Patricia Mays changes after the signing of this agreement or must be shared with additional parties, if the subject home is purchased as a short sale, or if Patricia Mays is prohibited from distributing the Credit. Lender approval is required for commission credit. In some circumstances buyer’s lender may not allow buyer to receive a credit so Patricia Mays Real estate services cannot guarantee that all lenders will allow 100% distribution of the Credit.. The credit towards the closing cost will only issue to the person(s) and/or entity listed on the recorded deed which transfers ownership of the subject real property at the closing of a transaction, regardless of whether such person(s) and/or entity are the buyer. 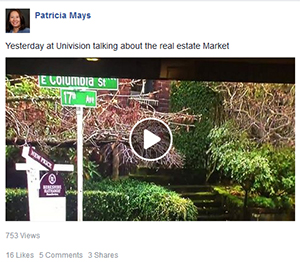 Subject to these limitations and where allowed, the Patricia Mays Real estate can be provided at or after closing. Estimated Patricia Credit amount not guaranteed.